Of course the FBI and DOJ are disputing this account and defending Rosenstein. The swamp always protects their own. A DOJ official told Fox News that Rosenstein “never threatened anyone in the room with a criminal investigation.” The official said the department and bureau officials in the room “are all quite clear that the characterization of events laid out here is false,” adding that Rosenstein was responding to a threat of contempt. This Fox News report confirms what attorney Gregg Jarrett previously stated in early February. Gregg Jarrett tweeted: A 2nd source has now confirmed to me that, in a meeting on January 10, Deputy A-G Rosenstein used the power of his office to threaten to subpoena the calls & texts of the Intel Committee to get it to stop it’s investigation of DOJ and FBI. Likely an Abuse of Power & Obstruction. Gregg Jarrett says what Rosenstein did is a crime. Rosenstein should no longer serve as DAG, [if true] said Gregg Jarrett in February. On Tuesday, Gregg Jarrett took a swipe at fake news HuffPost. Rod Rosenstein is the cancer of the Justice Department and must be removed. 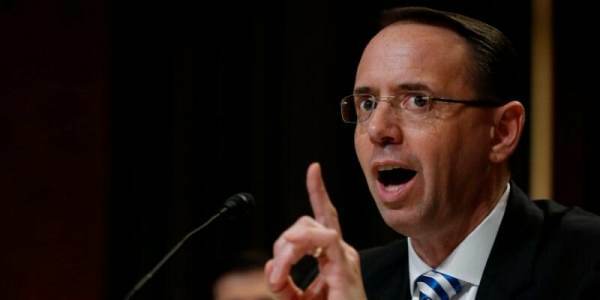 Sources say Rosenstein is behind the stonewalling and slow walking and attempted redactions of the much-anticipated IG report. Rosenstein is also trying to block Senate Judiciary Chairman Chuck Grassley from interviewing FBI Special Agent Joe Pientka because he has damning information on the altered General Flynn 302’s.